Client PC system boots normally, but after loading about 2 or 3 minutes, the mouse does not work. 1) Start a client PC with super client, click the "Start" button, and enter "regedit" in the "Run" edit box, and then press the "Enter" key. 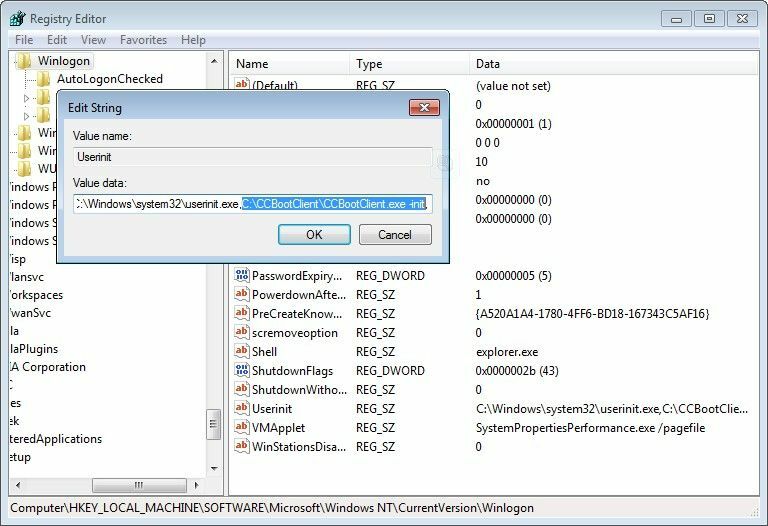 2) In the pop up "Registry Editor" form, navigate to "HKEY_LOCAL_MACHINE\SOFTWARE\Microsoft\Windows NT\CurrentVersion\Winlogon", in the right side of the form, double click "userinit", delete "C:\CCBootClient\CCBootClient.exe -init," from "C:\Windows\system32\userinit.exe,C:\CCBootClient\CCBootClient.exe -init," (Note: Only keep the first comma, the second comma should be delete.) (Figure 1-1). 3) Close the "Registry Editor" form and shutdown this client PC. 4) On CCBoot server, open CCBoot main interface, click the "Client Manager", in the right side of the details pane, find the client PC you have just enabled super client. Double click this client, in the pop up "CCBoot Client" dialog box, uncheck the "Enable Super Client" check box to disable super client.